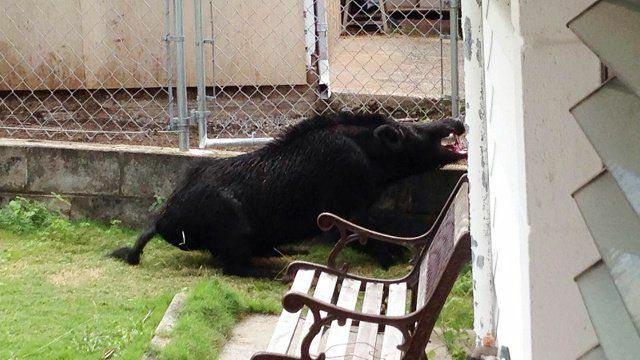 Hawaii-An Aina Haina resident captured a photo of a feral pig in the neighborhood on Tuesday. The pig walked up the driveway of one home at around noon and charged Bailey, the resident’s dog. The feral pig got its tusks lodged in the fence in the back yard. After the pig got free, it charged one of the residents before running back down the driveway. The resident says a yard connected to his has a low-hanging mango tree as well as a cat that was out in the yard and may have attracted the pig. The Department of Land and Natural Resources said their crew is on Molokai for a conference on dealing with feral pigs. The Oahu Pig Hunters Association was also contacted and said that the feral pig is indeed a full-sized male boar.